On February 1, 1960, four African American college students sat down at the lunch counter at Woolworth’s Department Store in downtown Greensboro and asked to be served. They were refused, launching a sit-in movement that would spread throughout North Carolina and the South. The four students, Ezell Blair, Jr. (later known as Jibreel Khazan), Franklin E. McCain, Joseph A. McNeil and David L. Richmond, were all freshmen from nearby North Carolina A&T State University. Sit-ins by college students during the next several months forced the integration of businesses in the region. Local media attention led to national coverage. The protest spurred similar efforts across the country, sparking a national call to battle by civil rights activists who endorsed the nonviolent form of protest to demonstrate society’s inequities for blacks. In April 1960, the Student Nonviolent Coordinating Committee (SNCC), an outgrowth of the sit-in movement, organized at Shaw University in Raleigh. The sit-ins and demonstrations throughout the South, slowly led to changes in local attitudes. Nationally, these and other protests ultimately led to the passage of the Civil Rights Act of 1964 and the Voting Rights Act of 1965, both of which assured the legal rights of blacks. Preddy with his plane. Image from the 352nd Fighter Group Association Archive. On August 6, 1944, Greensboro native George E. Preddy Jr., the top P-51 Mustang ace during World War II, downed six planes on a single day, earning a Distinguished Service Cross—the nation’s second highest award—in the process. In April 1944, his squadron received the P-51 Mustang, and Preddy named his the Cripes A’Mighty. That same year he became the 487th’s temporary commander Fighter Squadron. While flying in pursuit of a German plane during the Battle of the Bulge, Preddy was accidentally shot down by friendly ground fire. He is buried at the Lorraine American Cemetery in France. 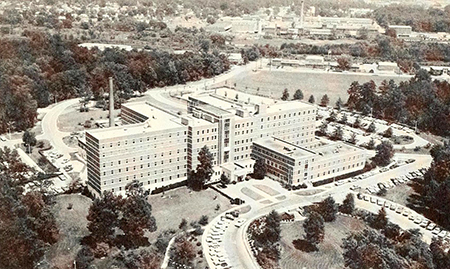 Cone Hospital in the 1960s. Image from the North Carolina Digital Collections. On December 5, 1962, a U.S. district court dismissed a suit against two Greensboro hospitals challenging “separate but equal” treatment in private, non-profit hospitals. The case was ultimately overturned on appeal. The suit, now known as Simkins v. Cone, was brought by African American medical professionals and their patients against the Moses H. Cone Memorial and Wesley Long Community Hospitals. Their objective was to gain admission privileges for themselves and their patients. The plaintiffs argued that, even though the hospitals were private institutions, their “separate but equal treatment” was unconstitutional because the institutions received state and federal funding under a 1946 federal law and various federal regulations. The district court held that, because the hospitals were not agencies of the state, the suit should not go forward. The U.S. Court of Appeals for the Fourth Circuit found that the institutions were connected to the government and that discriminatory treatment violated the Constitution. Since the U.S. Supreme Court declined to review the case, it was only legally binding in Maryland, Virginia, West Virginia and the Carolinas, but the ruling helped turn the tide toward hospital desegregation across the South. It was the first time a federal court prohibited racial discrimination by a private entity. Lindbergh’s Spirit of St. Louis arrives in Greensboro. On October 14, 1927, Charles Lindbergh landed at Lindley Field in Greensboro to celebrate its opening. In the 1920s Greensboro businessmen touted their city as the site for a major airport, since it was the mid-point between northern cities and those in the Deep South. Leaders from Greensboro, High Point and Winston-Salem worked to establish an air field on property purchased by Guilford County and Greensboro from Paul C. Lindley in 1927. Drawing visitors to the opening ceremony for Lindley Field was national hero Charles Lindbergh in his famous airplane, The Spirit of St. Louis. Lindbergh completed the first nonstop solo flight from New York to Paris in May 1927. Drawing on his success, he flew throughout the United States to encourage air flight. He visited Lindley Field as part of a three-month tour that took him to 48 states and 82 cities, racking up 147 speeches and 1,290 miles of parade routes. As a result of his tour, interest in the uses of air flight, particularly the use of air mail, skyrocketed. 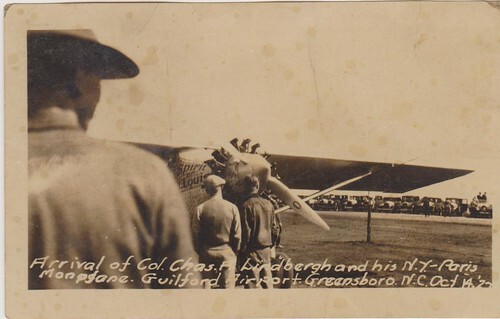 Lindbergh’s Greensboro visit, one of only two in North Carolina during the tour, highlighted the potential prominence of the city as an aviation center. N.C. A&T students sit-in at a lunch counter in Greensboro. On July 25, 1960, Greensboro lunch counters opened to sitting customers of all races for the first time. The event was the culmination of a brief and intense desegregation campaign by black activists that sparked similar actions throughout the country. In February of that year, four students from North Carolina Agricultural and Technical College began a sit-in at the lunch counter of downtown Woolworth’s, demanding equal service with white customers. The original demonstrators, Ezell Blair Jr., Joseph McNeil, Franklin McCain and David Richmond, were joined on succeeding days by more and more protestors, and the campaign they began spread to other stores. After six days, stores closed and the protesters declared a moratorium to negotiate with civic leaders. Similar protests spread throughout the South, while supporting demonstrations were launched in the North. Negotiations failed and the demonstrations resumed in April. Stores that refused to seat black customers at their lunch counters were picketed. By the end of June, store managers gave up as the boycott hurt their businesses. After new negotiations, it was agreed that blacks could eat at Greensboro lunch counters. The successful outcome of the campaign marked an important state and national milestone in the on-going civil rights struggle. Visit: The International Civil Rights Center & Museum is now located on the site of Woolworth’s lunch counter where the sit-in movement began. It is open to the public Monday through Saturday. Tommy John (left) and Dr. Frank Jobe talking to each other. Photo from the Los Angeles Dodgers. On September 25, 1974, Greensboro native Frank Jobe, an orthopedist for the Los Angeles Dodgers, replaced pitcher Tommy John’s torn medial collateral ligament in his pitching arm with a tendon from his wrist. The injury had ended pitching careers since the beginning of baseball but, thanks to Jobe’s efforts, John resumed his career after a successful rehabilitation, playing for another 14 years and amassing 164 victories. The procedure, which has come to be known as the “Tommy John Surgery,” has saved the careers of countless pitchers and position players in all levels of baseball ever since. A circa 1943-45 aerial view of the O.R.D. Image from the Greensboro Historical Museum. On September 15, 1946, the massive Greensboro Overseas Replacement Depot closed its doors. The O.R.D., as it was known, originally operated as a training base, buy by May 1944, the Air Force had reached its projected capacity and the facility became the primary point in the eastern U.S. where soldiers were prepared and processed for overseas duty. In February 1945, the O.R.D. took on added duties as a redistribution station, working to place about 31,000 troops in the Far East, as the focus of fighting shifted. In September 1945, the station began processing personnel for separation from duty. Thus, during its period of service, the Greensboro depot provided a wide range of services to the military. More 330,000 troops were processed in or out of service or redistributed to another location through the center. Eating in one of the O.R.D.’s dining halls, circa 1943-45. Image from the Greensboro Historical Museum. The base was truly massive. At 652 acres in size, it was the largest base in America located within the boundaries of a city, and as many as 40,000 soldiers were stationed at the Greensboro facility at any given time. Spread over nearly 1,000 buildings, the base included 500 barracks, 14 mess halls, 55 recreation rooms, four movie theaters, ten post exchanges, five chapels, three libraries, thee gyms and a hospital. The base even had its own newspaper and radio station to keep the troops entertained. On November 3, 1979, the “Death to the Klan” March took place in Greensboro. The march resulted in a shootout between members of the Communist Workers Party (CWP), the Ku Klux Klan and a neo-Nazi group. Only four city police officers were assigned to the demonstration in hopes that the low profile would avoid trouble. An unusual stipulation of the parade permit was that CWP members would not carry weapons. The Klan had been informed of the march and planned an armed confrontation, but the CWP was not warned of this. Demonstrators gathered at Morningside Homes, where the march was slated to start, singing protest songs and making picket signs. Local media filmed them. Unknown to anyone else, some of the CWP workers had weapons in their vehicles. Klansman and Nazis drove past the assembling demonstrators. The heckling turned to a physical confrontation and escalated to shooting. Five CWP workers, often using a media van for cover, were killed in the 81-second shooting. Only one vehicle from the 10-vehicle caravan of Klan members and neo-Nazis was apprehended, though numerous CWP members on the scene were arrested. The next day 14 Klansmen and Nazis were charged with first-degree murder, felony riot and conspiracy. On June 5, 1910, writer William Sidney Porter, known to the world by the pseudonym O. Henry, died. Born in 1862 in Greensboro, Porter was raised by an aunt who educated him until he turned 15, when he began work in his uncle’s pharmacy. In 1882, Porter left Greensboro for Texas, where worked as a rancher, an experience that would later manifest itself in his writing. Over the next 14 years, Porter worked various jobs in Austin, Texas, including stints as a bookkeeper, draftsman and bank teller, all the while writing short stories, sketches and humorous pieces for several newspapers. In 1896, Porter moved to Houston for a newspaper job. Once there, he was indicted by an Austin court on charges of embezzlement stemming from his tenure as a bank teller. He fled to Honduras but subsequently was arrested, convicted and ordered to serve five years in prison. While incarcerated, he had time to engage in serious writing and by the time he was released for good behavior in 1901, Porter had several works published. In 1902, he moved to New York, and wrote more than 100 stories in less than two years. He moved to Asheville in 1907 where he lived until his death.